3-step safeguard devices on PCB, Heater & Motor to prevent overheating. Power automatically cuts off after a continuous use of 60 seconds. 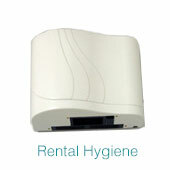 Since 2002, Rental Hygiene is dedicated to total washroom hygiene care. We have raised washroom hygiene standards and will continue to do so in the future through product and service innovations.